Industrial plants across the country make use of various chemical substances. Many of these substances present serious health and safety risks, such as toxicity and corrosion. 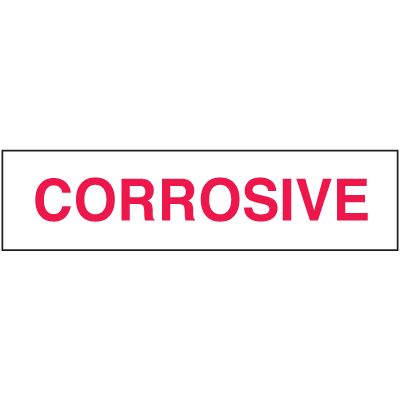 Inform people when they are near corrosive materials with Corrosive Labels from Seton. Common chemicals that require such warnings are hydrochloric acid, sulfuric acid, nitric acid, and ammonia. Provide your facility with hazard warning labels that indicate which chemicals can corrode metals, or burn human tissue. Seton’s line of hazard warning labels is designed with OSHA-compliant headers as well as standardized texts and graphics that indicate specific corrosive hazards, as well as general danger warnings. Choose the type of corrosive sticker in the specific size, shape and design that best suits your needs. Prevent injuries that result from harmful chemicals and chemical reactions. Corrosion-causing substances can permanently destroy materials they come into contact with. Because of this, corrosive chemicals, or chemicals used with a corrosive material, should be used with caution. Notify people when they are handling such materials. Provide the proper safety labeling with Seton’s Corrosive Labels. Corrosion refers to the chemical process in which materials, particularly metal deteriorates. This process can be caused a number of factors, such as interaction with air, water, salts, acids or a combination of elements. Acids especially strong acids such as sulfuric acid (also known as battery acid), chemically react with metals and polymers. This is why this type of acid can burn holes into certain types of fabrics. 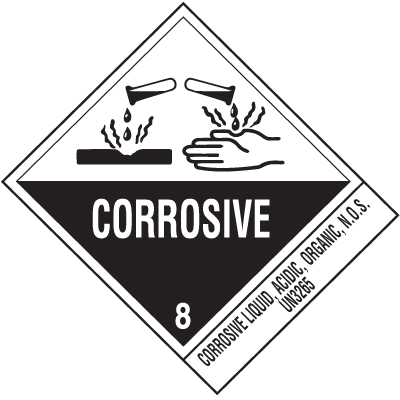 Corrosive materials may also react with other substances, forming dangerous byproducts. With HCl, oxidizers may result in chlorine gas, which is very toxic and hazardous. 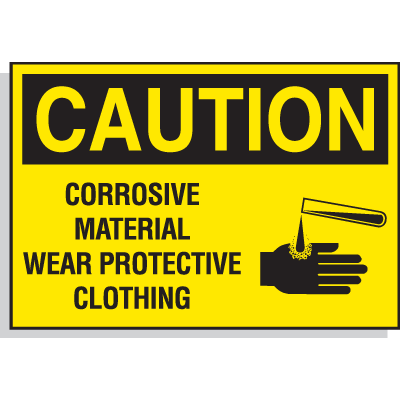 Make sure that employees remain safe even while handling corrosive materials. Given the nature of strong acids and other highly corrosive substances, it is important that personnel tasked with handling these substances take the proper precautions. Always remember to wear the proper personal protective equipment such as gloves and goggles. Employers and safety personnel for their part should ensure that holding containers and storage areas for corrosives are properly identified. Protect your employees from chemical burns and toxic byproducts. Make sure to keep them aware of corrosive materials with Corrosive Labels from Seton.